Final ads from this summer's Bauer shoot via Olson were just received - a couple of selects are featured below. The ads were shot in Atlantic City, NJ this past July at Bauer's "2009 Athlete Camp." Bauer brought in over 20 top NHL players they are partnered with for two days of apparel / product shooting both on and off the ice. I spent the first of the two days shooting in a locker room environment- fabricated inside a hotel conference room. Five lockers were taken from the Philiadelpha Flyers locker room and trucked to Atlantic City for this shoot. It was tough to visualize how this would look in our early pre-pro meetings. Once on site, all came together quite nicely. One of the locker room scenes I was tasked to capture involved atheletes working with (taping, flexing, etc.) Bauer's latest addition to the stick market - the Vapor X:60. Check out Bauer's new site- it features dozens of shots from projects I've worked on over the past few years. If you care to go deeper check out the Bauer Blog, specifically the November 16th post where you'll see behind the scenes footage from this summer's shoot. A slower pace is what I associate with trips to the deep south. For me it’s a welcome change when I am visiting my retired in-laws near Lafayette, LA (the childhood home of my Mother-in-law). 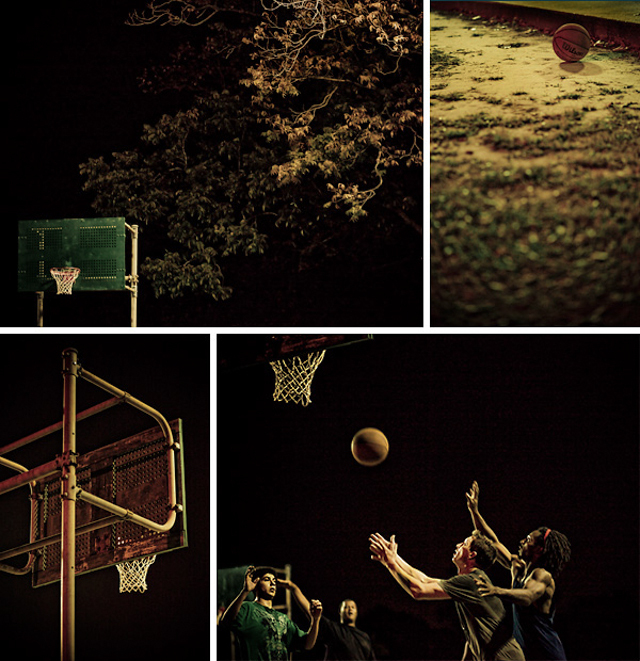 One evening while driving with my five-year-old son Wes, we happened upon a game of street basketball near the campus of USL (University of Southern Louisiana). The game suggested anything but the aforementioned pace. Arms flying about, the squeaky sound of soles on worn pavement, and a flurry of ball handling captivated us both. I pulled out my camera to grab a few frames as Wes sat beside me. Editing the images weeks later I am reminded of the sights and sounds -- the rhythm of the players interspersed with the empty metal gong from a missed attempt; a court tired and worn-surely to have been replaced in most other parts. The experience altogether nicely summarizes what I look forward to when traveling to this part of the country; unpolished living that may lack in luster, but as a result makes living seem all the more richer. Setting out well before daybreak we aimed the nose of our vehicle in a North West direction and hours later arrived at the Red River, crossing over to the city of Fargo, ND. The motivation behind the early morning road trip was a piece for Business Week featuring the financial practices of a local couple. Before heading over to the location my assistant and I decided to take a quick drive around Fargo. Downtown in the middle of Broadway a tall structure of steel and lights stood suspended spelling out its namesake as a stoic reminder that the iconic 1926 art deco movie theater is alive and well eighty-three years later. Much like the theater, Fargo gives the impression of a city full of hearty, hard working folks, living in the northern heartland.